Houses Gardens People: Redesign and Win! Redesign and Win! 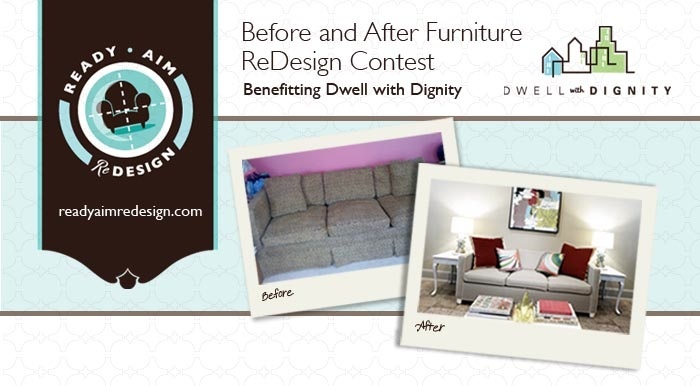 Dallas-based interior design charity Dwell with Dignity is teaming up with some of the top bloggers and design experts across the country for Ready Aim Redesign, an exciting Before & After furniture redesign contest that puts your design and refinishing skills to the test. Win a 47-inch Sharp flat screen LCD TV, a $1,000 Container Store Elfa Makeover, and other prizes! I'm honored to be one of the judges, along with Jonathan Adler, Grace Bonney of Design Sponge, Crystal Gentilello of Rue magazine, Samantha Reitmayer-Sano of Style Swoon, and Ronda Carman of All the Best.